When it’s cold and damp outside, I think there’s nothing more warm, tasty and delicious than homemade chicken, tarragon and mushroom pie. I made this for my husband’s family on Boxing Day Night, but it’s also the perfect hangover cure for New Year’s Day and freezes beautifully too. 3 tbsp. of Noilly Prat or more depending on taste! 340g of puff pastry (I use shop bought!) and a little milk or egg for glazing. 2. Place the chicken in a large saucepan and cover with water. Add the carrot chunks, onion quarters, 6 black pepper corns, bouquet garni and a pinch of salt to the pan. Bring to the boil, then turn down to simmer for 1 hour or until the chicken juices run clear when tested with a sharp knife. Once cooked, let the chicken cool in the stock. 3. Melt a large knob of butter in a frying pan and fry the finely chopped onion until soft (about 6 minutes or so). Add the button mushrooms to the frying pan, sprinkle with dried tarragon and cook for 5 minutes until the mushrooms begin to soften. (Sometimes I need to add a little more butter at this stage to stop the onions catching). 4. Remove the chicken from the stock, stripping all the meat from the bones and placing them in a deep 2 litre pie dish. Now strain the stock and reserve for later. 5. To make a roux sauce, in a large pan melt 85g of butter and add the flour. Cook the butter and flour for 1-2 minutes and gradually blend in the milk, chicken stock, cream and Noilly Prat stirring all the time until the sauce boils. Season the sauce with salt and pepper and now add the button mushrooms, fried onions and chopped fresh tarragon. Pour over the chicken meat in the pie dish and stir well. 6. Roll out the puff pastry and cover the pie, lightly brushing the pastry with milk or a beaten egg. Bake at 220C for 20 mins then lower the heat to 180C and cook for a further 20 mins or until the pastry is golden brown. I usually freeze any stock I have left over from this recipe and defrost at a later date to use in sauces and homemade soups. I also like to batch cook so there’s always something in the freezer for nights when I want a homemade ready meal. 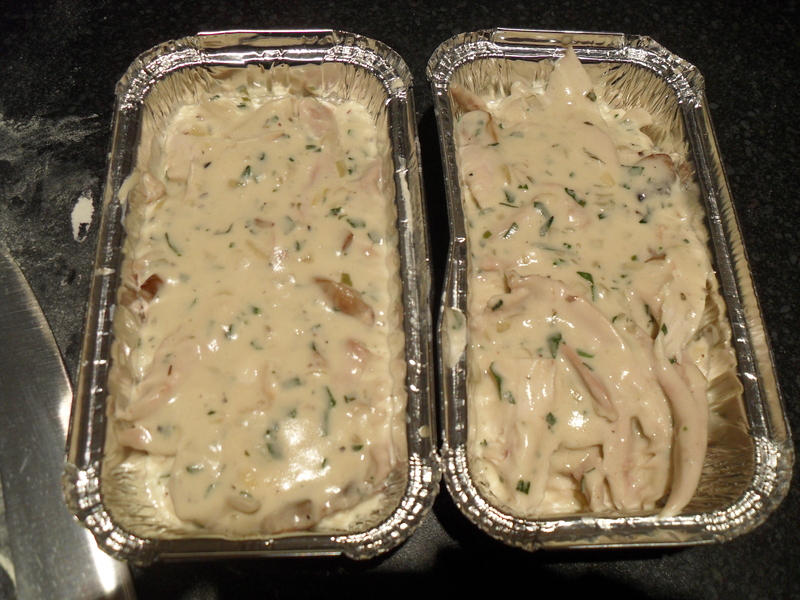 To make 4 – 2 person portions, subdivide the contents of the pie at stage 5, into 4 – 105 x 195 x 50mm aluminium foil trays with lids and freeze before cooking. When I want to eat, I simply defrost 1 aluminum tray (which feeds 2), and brush the pastry with milk before placing in my Rayburn at 180C for 30 mins or until piping hot. I like to serve this with new potatoes, baby sweet corn, carrots and broccoli. A good alternative to home cooking is Cook’s Chicken, Ham and Leek Pie or Waitrose’s Chicken, White Wine and Tarragon Pie. Form and Field also offer a great selection of pies delivered direct to your door. 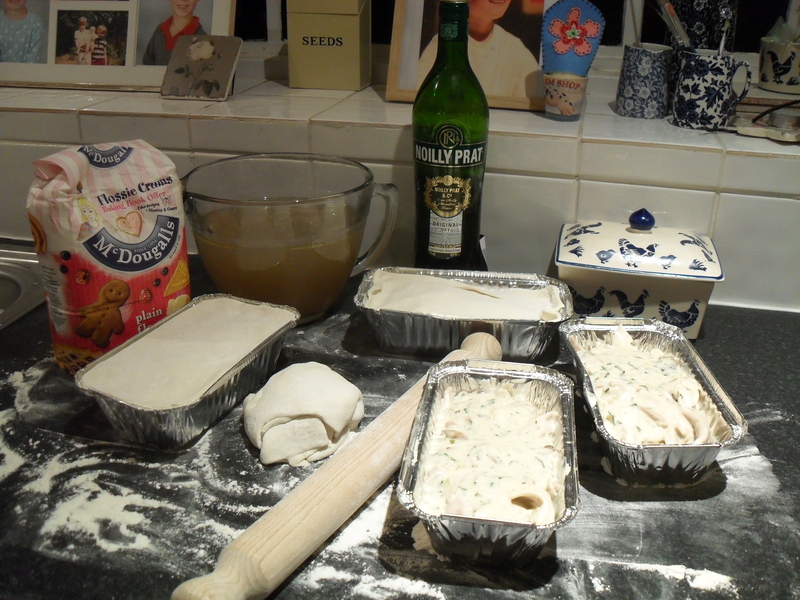 This entry was posted in Cooking and tagged Black pepper, Boxing Day, Butter, Cook, Cooking, Home, Mushroom, New Year's Day, Onion, Pie, Puff pastry, Stock (food), Tarragon, Wine. Bookmark the permalink.